DTR instrument is a one-trip, no return, temperature recorder, specifically designed to monitor sensitive or temperature controlled commodities during transport. 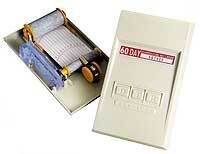 DTR produces a continuous strip-chart monitoring temperature and timefrom shipper to receiver. Dependability - the instrument is spring powered and performance tested and adjusted to close to tolerances during a test-run. Tamper Proofing - the instruments are welded together at the factory and will not function if open. these DTR exclusive features prvide records with highest level of credibility. Convenience - the disposable features of DTR relieves receivers of returning instruments and eliminates foreign receivers from the need to file custom report.